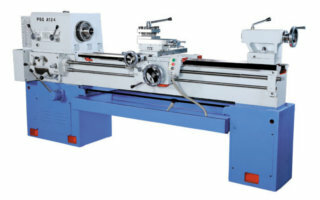 PSG 124 / A 124 type lathe is a heavy duty precision lathe renowned for its productivity in turning accurate components. Ideally suited for general engineering and other production shops, its proven design guarantees several years of trouble-free service. The main spindle runs on precision taper roller bearings. The built-in safety features ensure reliable operation. The main drive gears are made from nickel-chromium steel, hardened and precision ground. The bed guideways are also flame hardened and precision-ground. To improve productivity, attachments like hydraulic copying attachment or taper turning attachment can be fitted. Range of longitudinal feeds 0.03 to 1.14 mm/rev. Range of transverse feeds 0.009 to 0.33 mm/rev. Apron dial graduation 0.20 mm / div. Cross slide dial graduation 0.05 mm / div. Tool slide dial graduation 0.05 mm / div. Tailstock dial graduation 0.1 mm / div. Motor for coolant pump 0.075 kW (0.1 hp), 2880 rpm, 415 V, 3 phase, 50 Hz, AC, 30 Lit. / Min.